Good luck! He will need it for the nerve wrecking day he has ahead so what beter way to share some fine words of wisdom? 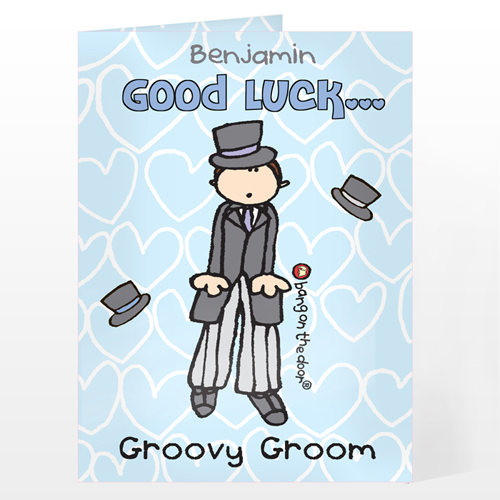 Personalise this Bang on the Door 'Groom' card with any name and message on the front and any message on the inside spread over five lines using up to 20 characters per line. 'Groovy Groom' will be fixed text on this item. Card will come delivered in a brown outer envelope with a plain white envelope inside. Please note we are unable to support special characters or accented letters, please refrain from entering these within your personalisation.